Weddings at Crowne Plaza Hawkesbury Valley are very special occasions. Flanked by gorgeous landscaped gardens at the foot of the Blue Mountains, Crowne Plaza Hawkesbury Valley is a dream venue for the perfect wedding. The resort supports a variety of wedding styles, and customized wedding packages make each wedding unique and unforgettable. The four wedding packages (platinum, diamond, sapphire, and amethyst) include distinctive and romantic floral arrangements that’s sure to fulfill every bridal expectation. Platinum and Diamond package bridal customers with at least 100 wedding guests will be gifted a $1,500 ACCOR gift card, which can be used at over 200 participating hotels in Fiji, New Zealand, and Australia. 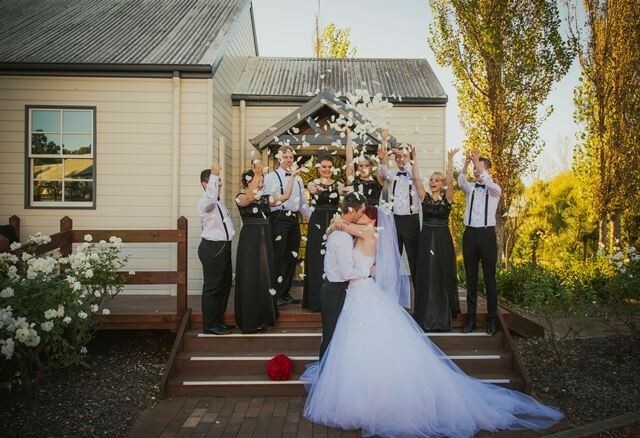 Couples who marry at Crowne Plaza Hawkesbury Valley can also choose from lakeside, chapel, or woodland venues for a personalized ceremonial experience. Crowne Plaza Hawkesbury Valley has four reception rooms: the Governor Phillip Ballroom, the Lachlan Macquarie Room, the Windsor Room, and the Gazebo. The Windsor Room is the largest, seating up to 130 guests. Its pristine ceilings lend an ambiance of elegance to the room, and its outdoor courtyard overlooks plush landscaped gardens. For a more intimate experience, couples can choose the classic Lachlan Macquarie Room, which seats up to 70 guests. Unique among premier 4.5 star resorts, Crowne Plaza Hawkesbury Valley caters to even the most discriminating budgets. It offers two wedding specials: the Midweek Special and the Love Is In The Air Special. For accommodations, the resort hotel offers tastefully furnished rooms, suites, and apartments, with luxurious Executive, Spa, and Deluxe options. Guests can take advantage of Crowne Plaza Hawkesbury Valley’s sumptuous Gazebo and Harvest restaurants as well as its Barracks Bar. Harvest restaurant has recently been refurbished in the French provincial style, replete with marble fireplaces, plush carpeting, and metallic, frosted ceiling lamps. For the ease and convenience of every bridal couple, Crowne Plaza Hawkesbury Valley also works with an exclusive group of bridal suppliers, from florists to photographers. The resort is committed to an exceptional wedding experience for every couple’s special day. One of the resort’s wedding suppliers is none other than the Lily Road Band, one of Australia’s best wedding bands. Lily Road Band boasts the best wedding singers Down Under. For wedding entertainment, Lily Road Band is the exquisite choice of every discerning bride and groom. Every wedding singer in the band is well-versed in a variety of musical genres. Lucky patrons can enjoy everything from hip hop to classic pop at receptions. Enthusiastic former guests claim that Lily Road Band wedding singers are skilled at entertaining even the most reserved of guests, whether they choose to dance or not. Those who do dance report that the music set the tone for the evening. Every wedding singer or member of the band has either recorded his/her own albums or shared the stage with the likes of John Legend, Taylor Swift, Angus and Julia Stone, INXS, Pete Murray, Guy Sebastian, and The Whitlams. Additionally, all Lily Road Band singers have at one time or another been top finalists on The Voice, X Factor, or Australian Idol. Because of the versatility of the band’s singers, couples can choose from a variety of songs for weddings; according to the band’s Facebook page, their singers have even performed pieces by Metallica. Certainly, Lily Road Band is familiar with a wide variety of musical styles and genres from the 60s to the present day. The band is prepared to lavish every stage of the wedding ceremony with elegance and jubilation. Therefore, there are special songs for weddings the bride’s walk down the aisle, the signing of the register, the processional, the time before dinner is served, and the dinner reception itself. For example, for the walk down the aisle, Lily Road Band may perform pieces like John Legend’s All Of Me, Ed Sheeran’s Tenerife Sea, or even the Beatles’ Here Comes The Sun. For the signing of the register, you may hear anything from Elton John’s sentimental Your Song to Leonard Cohen’s sweet Hallelujah. For the processional, guests may be treated to Israel’s Somewhere Over The Rainbow or even Imagine Dragons’ On Top Of The World. Many guests look forward to Lily Road Band’s dance music; the band’s wedding singers have been known to rock the dance floor with numbers like Bon Jovi’s Living On A Prayer or Pharrell Williams’ Happy. Additionally, the band offers wedding packages for every budget, from silver to deluxe options.